You probably know that meeting UPC bar code requirements can be a job in itself. Manually stapling tags onto ends of lumber is not only time-consuming, but also tiring. That's why Weber developed the improved pneumatic FasTagger II lumber end-tagger. The FasTagger II is a labeling system specially built for lumber mills, lumber yards and forestry product companies that combines a heavy-duty stapler with a label dispensing apparatus that allows fast one-handed end tagging of finished lumber. The system feeds preprinted polytags into the stapler and attaches and cuts the label from the roll with the squeeze of the trigger. The quick way to safely label truckloads of lumber in just minutes. Shop now at Go-Label.com for the FasTagger II lumber labeler. 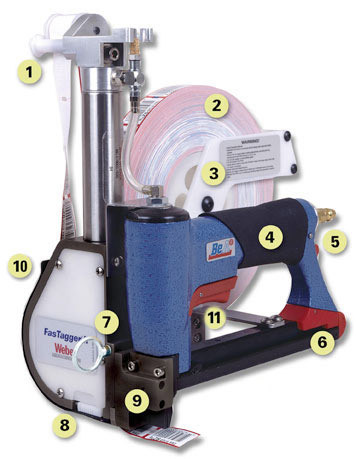 Like FasTagger II's predecessor, the original FasTagger, it's the automatic tagging tool that dispenses Weber Poly Tags and staples them securely in place — all in one step. The FasTagger II uses compressed air to apply tags at a rate of over 100 tags per minute. Your operator simply places the tool against the end of a piece of lumber and pulls the trigger. The FasTagger II automatically staples the tag to the lumber, cuts it, and then feeds the next tag into position. A special feed mechanism increases speed while decreasing chances for tag jam up. 1. Turnbar tower/roller assembly accurately guides PolyTags as they are fed through the tool. 2. Tough PolyTags resist fading and readily accept thermal-transfer printing. 3. Rugged protective roll housing holds up to 8.0" O.D. rolls of PolyTags. 4. Anti-slip grip helps prevent hand from slipping. 5. 1/4" industrial interchange air coupling. 6. Staple magazine holds up to 179 staples. 7. Tether ring helps reduce fatigue when used with a shock cord. 8. Quick-release tag guide opens smoothly with slide block and provides easy access to tags. 9. Tag cutter & stapler precisely cuts the tags and staples them in one continuous motion. 10. Durable Housing constructed of one-piece, anodized billet aluminum. And the FasTagger II is even equipped to handle the rare occasions that a tag does get caught. Its quick-release tag guide lets you easily reach the jammed tag and fix the problem immediately. 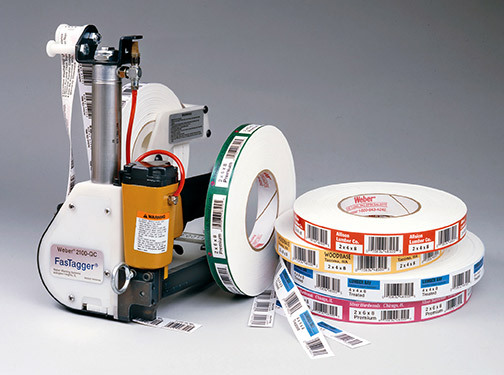 Because it accepts four different Poly Tag sizes, the FasTagger II is versatile enough to handle a full range of bar code and product identification needs. You can use tags of two different widths (11/16" and 7/8") and two different lengths (1-3/8" and 2-3/4"). The FasTagger II is designed to let you change tag length or tag width in less than ten seconds. All of these features come in one compact tool weighing only 6.5 lbs. including a full roll of tags. It's light enough to hold in one hand, yet durable enough to withstand the rough, outdoor environments found in lumber mills and treating plants.